Alexandria, Va. (April 28, 2014) - As school districts increasingly move to cloud computing instead of on-site data storage, the National School Boards Association (NSBA) and its Council of School Attorneys (COSA) have released a guide for school boards introducing the legal issues associated with protecting student data and suggesting best practices. The guide, “Data in the Cloud,” seeks to raise awareness of student data privacy concerns, and to provide a framework for comprehensive student data privacy approaches in school districts. Alexandria, Va. (April 25, 2014) – The National School Boards Association (NSBA) announced leaders for its three caucuses during its Annual Conference held in New Orleans earlier this month. The caucuses help school board members improve the academic achievement and address the unique needs of African-American, Latino, and Native American students. Alexandria, Va. (April 22, 2014) – A new guide released today details how school board members can build partnerships to secure a high-quality education, from early learning to graduation, for students in their districts. “Partnerships, Not Pushouts: A Guide for School Board Members on Community Partnerships for Student Success,” demonstrates how school boards can work with other community partners to provide seamless services and engage community members to improve their schools. Alexandria, Va. (April 17, 2014) - The National School Boards Association (NSBA) announces that Brokers’ Risk, HUMAN Healthy Vending, Kaplan K12, and Share 911 have joined as official service partners. Alexandria (April 10, 2014) – School board leader Anne M. Byrne of New York’s Nanuet Union Free School District was named the 67th President of the National School Boards Association (NSBA) at the association’s Annual Conference in New Orleans. Alexandria, Va. (April 10, 2014) – The National School Boards Association’s (NSBA) Council of Urban Boards of Education (CUBE) has elected new leaders and members to its Steering Committee. Washington, DC (April 7, 2014) - The John F. Kennedy Center for the Performing Arts today announced the recipient of the 26th annual Kennedy Center Alliance for Arts Education Network (KCAAEN) and NSBA Award. New Orleans (April 5, 2014) – The National School Boards Association’s (NSBA) Council of School Attorneys (COSA), the national network of attorneys representing K-12 public school districts whose mission is to support school attorneys and provide leadership in legal advocacy for public schools, elected new leaders and directors during its annual meeting in New Orleans. The 22-member Board of Directors oversees COSA’s continuing legal education programming and working groups for its 3,000+ members across the United States and Canada. Alexandria, Va. (April 4, 2014) — The National School Boards Association (NSBA) Executive Director Thomas J. Gentzel issued the following comments on the Federal Communications Commission (FCC) Public Notice on the Wireline Competition Bureau Seeks Focused Comment on E-rate Modernization to provide key recommendations to modernize the E-rate program and increase the quality and speed of Internet connectivity in our nation’s schools and libraries. 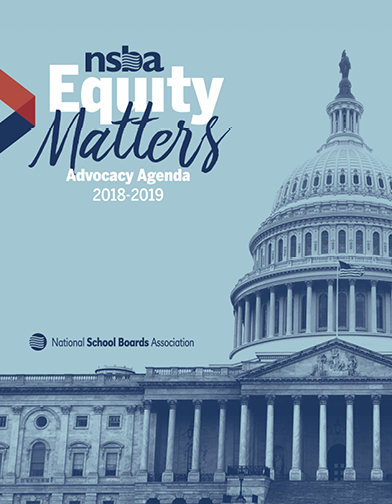 NSBA applauds the FCC’s proactive efforts to ensure efficient operation and integrity of E-rate; increase the quality and speed of connectivity in our nation’s schools; and address the technology gaps that remain.